More than 100 men and women, mostly elderly people of Sonarpur, got tips in cyber security from police on Friday. 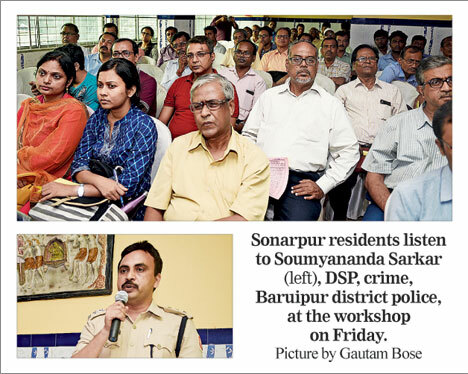 Sonarpur police station organised a cyber safety workshop for residents as part of an initiative by Baruipur district police. The workshop was aimed at making the elderly aware of the latest ATM fraud techniques and phishing among others and how they can go about protecting their money and what to do in case they are cheated. Such workshops and initiatives to create cyber awareness in the districts are rare, police said. “It is important to make people aware of the modus operandi of frauds, especially when cyber crime is on the rise” Arijit Sinha, superintendent of Baruipur district police, said. Officers of Sonarpur police station, along with the state CID, recently arrested three people from Jharkhand on charges of cheating a resident of the area. One of them had posed as the manager of a nationalised bank in Narendrapur and convinced the resident of sharing his card details, Paresh Roy, inspector-in-charge, Sonarpur police station, said. As soon as he got the details, he used it make online transactions of more than Rs 1 lakh, the officer said. Cops across Bengal are flooded with similar complaints where people make random calls and start speaking in English, Hindi or Bengali and identify themselves as bank officials. The usual method is to say they can help stop a card from getting blocked if the person shares his/her card details, the police said. “They will do their best to scare and confuse you, but never entertain such calls,” Roy told the audience. “We got plenty of hands-on tips on how to use ATM cards,” Pratap Aditya, 68, a resident of Sugam Park in Narendrapur, said. “I look forward to more such workshops.” S.K. Bardhan, in his 60s, said. Apart from police officers, many bank officials were present at the workshop. “One should be alert. In case one is cheated, he/she should know where to report to get the matter redressed effectively,” Soumyananda Sarkar, DSP, crime, Baruipur district police, said.